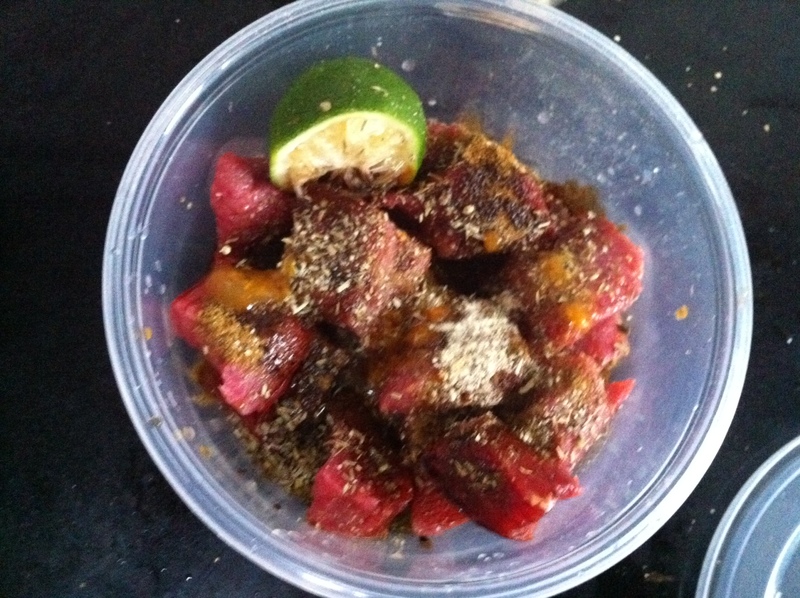 Dinner: Cuban Flank Steak… recipe below. I have to say, this is YUMMY!!! And if you leave out the mushrooms and only add onions, it’s a PP meal. I got the recipe idea from although I didn’t use flank steak and mine come cut in chunks already, which is how I have to eat them, given I don’t have an oven or a grill. Put meat in bowl or zip top baggie. Put the rest of the marinade ingredients in there. 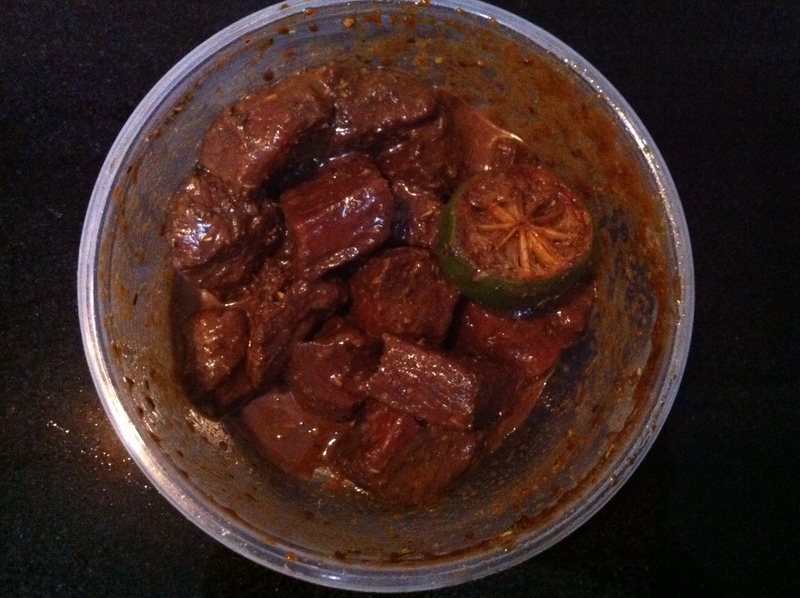 I thought about this marinating in my fridge ALL.DAY.LONG! Shake, shake, shake and put in the fridge for 8 or more hours. Remove marinated meat from fridge. When I took the lid off… yum… the smell was incredible! Put 1 Tbsp Olive Oil in skillet or wok. Put the meat in and cook for 5 minutes. Put the onions in and cook for 3 minutes. Toss the mushrooms in, if you’re making it a PV dinner, and cook for 3 minutes. I used Enoki mushrooms which are kind of like al dente pasta when cooked… sorta. And they basically have NO CARBS!!! My pics may not be stunning or artistic, but you can tell this food is GOOD! I’m off to Hong Kong for 3 days tomorrow (Weds – Friday) to renew my visa and get a little R & R. I’ll try to keep you updated from there! 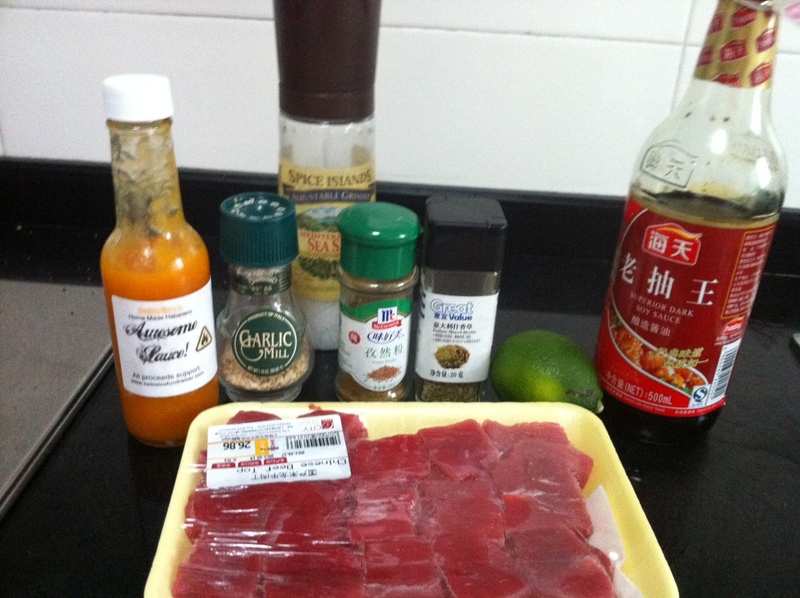 This entry was posted in China, Dukan Diet, Life, Running, Weight Loss and tagged Atkins, C25K, couch to 5 k, dukan cuban steak, Dukan diet, dukan marinated steak, dukan recipe, Dukan steak, dukan success, Exercise, Hong Kong, inspiration, low carb, low carbohydrate, low fat, perseverance, postaday, pure protein, PV day, running, tea eggs, travel, weight loss, weight loss success by flamidwyfe. Bookmark the permalink. (if you don’t want to I will not be offended)!! Thank you! I’ve gotten 2 Liebster Awards today… 🙂 I will definitely pass it on! Have a great time! You deserve some R&R for sure! Thanks, Susan… I’m looking forward to the little break! Hard part is maintaining my diet when I can’t control what is being cooked. Once again you have whet my appetite. Copied and will try. Enjoy your R and R.
Another fab dish- look forward to trying it! Have a fab time in Hong Kong :). Fab weather here, went on a spa day given to me by Mark & Harry, went with a dear friend, had a facial and a massage and a delicious dukan ? 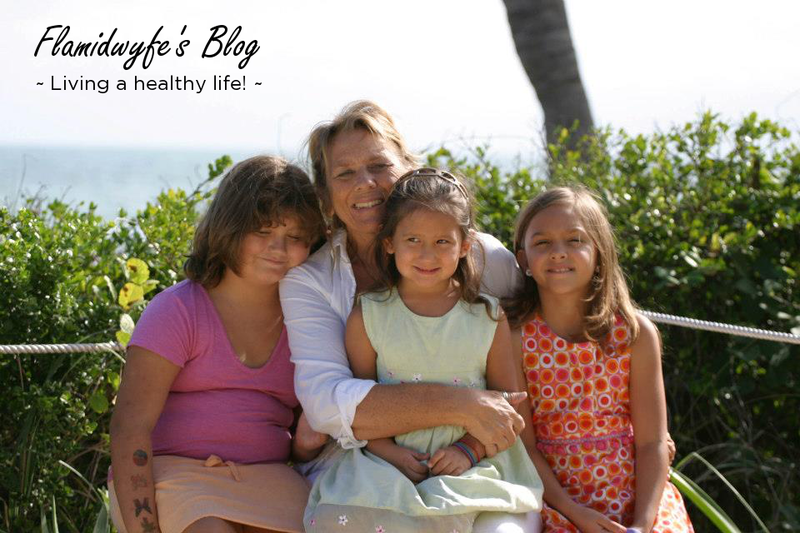 lunch – bliss, now lost 44 lbs, 6 more to go! One of my favorite things to make! I’m going to have to pull that one back out. It’s been a long time since I’ve made it! Hi Jamie! It was so delicious! Definitely a Dukan classic and easy to make! That dish looks very tasty. I am not familar with either Flank beef or Beef Top. Is it kind of like stewing steak – a bit tough and in need of marinading? I would love to try it! 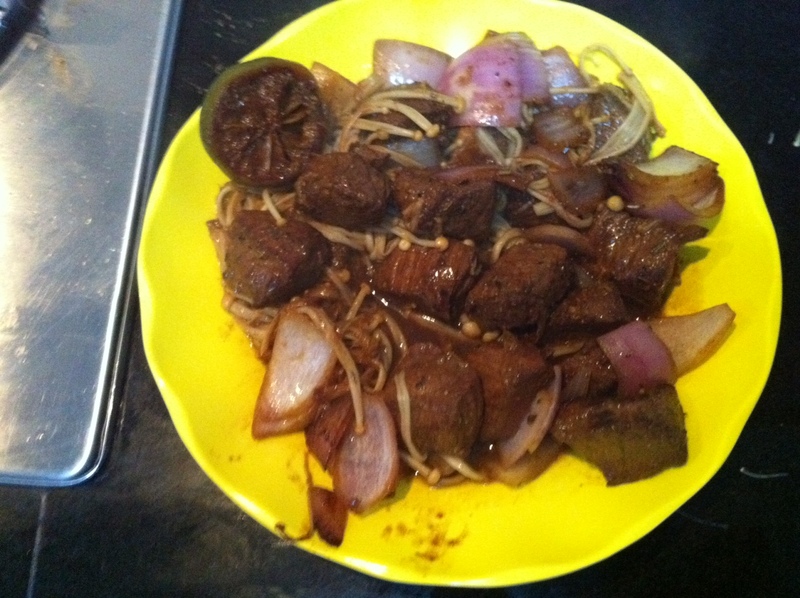 I would think that the steak chunks I had were like stewing steak… after the marinating they were perfect! That looks grrrreat! I love simple tasty recipes. 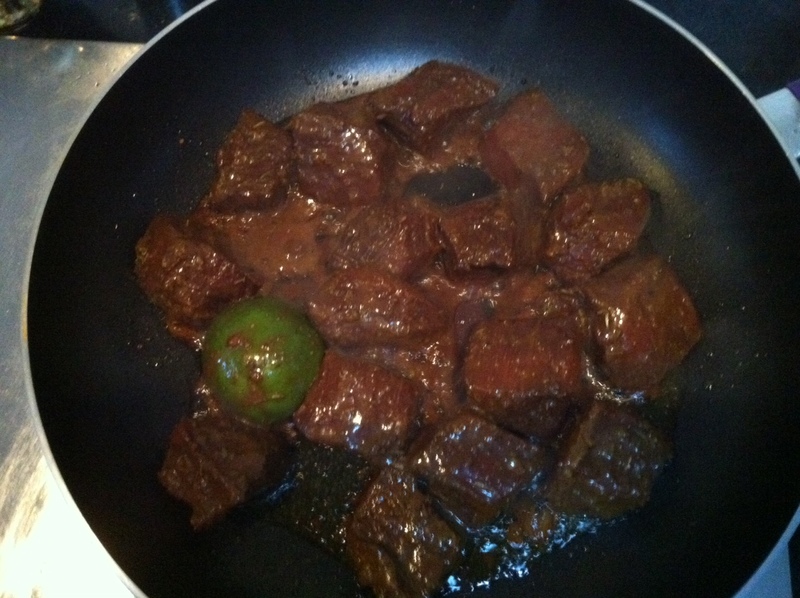 Love the lime in there, just never think to add that to meat/steak although I imagine it tastes terrific. Have a refreshing time in HK. 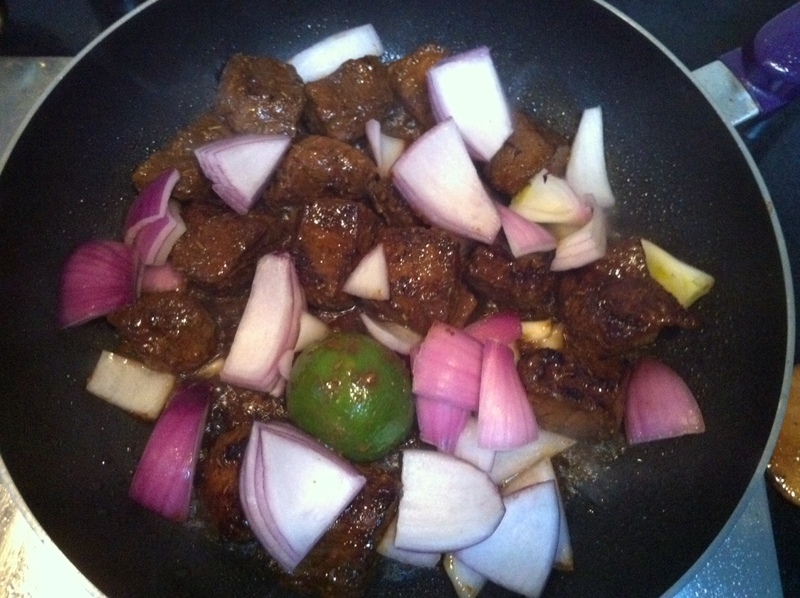 The lime adds a nice zest to the meat… Give it a try… Throw in some of that fresh asparagus instead of mushrooms… Yum!!! This looks pretty darn good. I think I’ll cook it this weekend. Awesome, Mona… Let me know how you like it! We made this tonight and loved it. Decided to take my chances and pick up some steaks, no complaints from the male half. Thanks for sharing! Ours did not look as good as yours though…I think I overcooked ours!